To inspire all of Washington County's young people, especially those who need us most, to reach their full potential as productive, caring, responsible citizens. Boys & Girls Club of Washington County provides a safe, positive place that promotes the social, educational, health, leadership, and character development of boys and girls during critical periods of their growth. 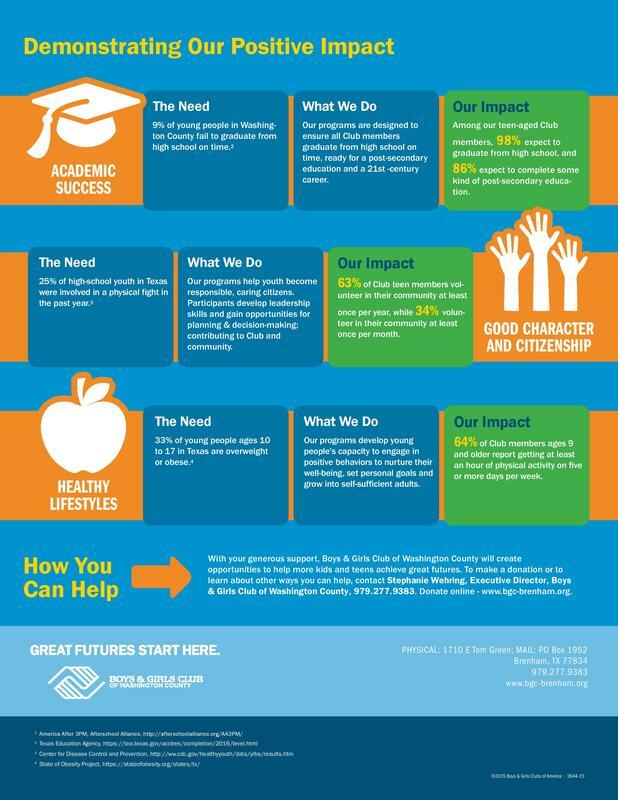 In Washington County, approximately 275 young people participate each day in Boys & Girls Club programs. The Club offers them an opportunity to see their own strengths and use them as a foundation for successful, productive lives. Our nationally recognized programs are designed first to enhance educational development - every day after school children receive homework assistance and tutoring. When school work is completed, programs focus on helping children realize their fullest potential as responsible and caring citizens. The Club is there when children's needs are greatest - after school and summer. Want to see how we make a difference? 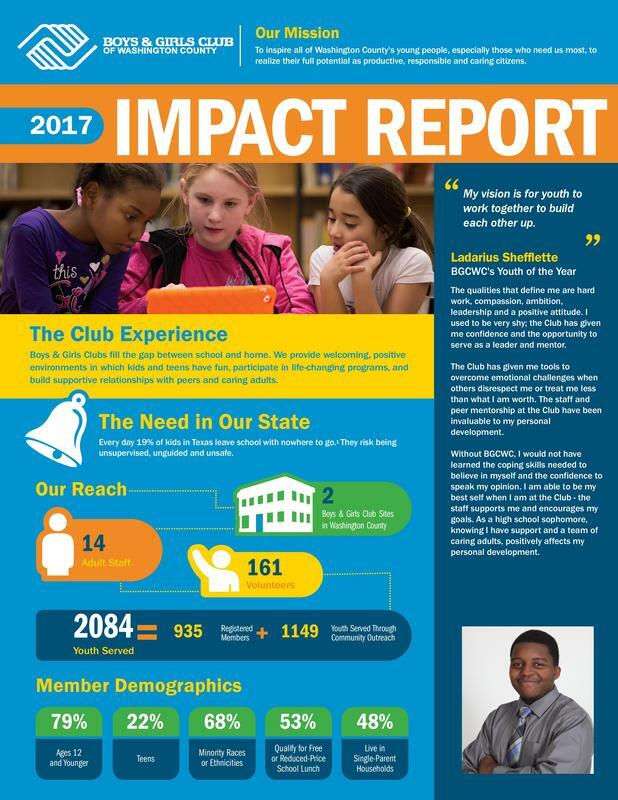 Here's our 2017 Impact Report! Boys & Girls Club of Washington County was established in June 1995 as a unit of the Boys & Girls Club of the Brazos Valley. The first home for the Club was the Rock Gym, the original Brenham High School gymnasium. ​In 2003, the Club received its own charter and non-profit status, thus becoming an independent club. The Club's growing membership and services to the community presented the need for a new home that was larger and specifically designed to host programs for children. The Club began a successful Capital Campaign that was completed in the early part of 2003 and construction on the facility began in October of 2003. The current facility was opened to area youth on July 6, 2004. Since it is strategically located near Blue Bell Creameries, two schools, the Aquatic Center, the high school football stadium and a major road way, we are accessible to the whole community and serve anyone between the ages of 6-18 years of age. Boys & Girls Club of Washington County has had great success serving the youth of Brenham. ​In 2008, the Club opened an additional unit in Burton, Texas for after school programming. In 2018, the Club expanded again by offering a full Summer Program located in Burton. The Burton Unit provides the youth of Burton with the same opportunities as those in Brenham.